The `familiar ` dark green M&D livery dates from the formation of the neighbouring East Kent company in 1916. Previously Flexman-French had mainly used red and cream for his buses, including those based at Margate that formed part of EK. Tilling, the largest EK constituent also used red and cream. Rather than the two companies both being red, with possible confusion for passengers, M&D switched to using the `green of the `British` BAT group who had taken shares in the company and their Deal based operation adopted Tilling red. The interesting thing about this is that the Tilling-Stevens is in the familiar M&D livery with the M&D name in the form of a scroll. The Leyland behind seems to be in the earlier livery, presumably similar to that worn by the preserved Hallford. I am not sure when the familiar livery was adopted but it must have been in the early 1920s. These Tilling-Stevens TS3 vehicles were long-lived by the standards of earlier vehicles and were rebuilt in the mid-1920s to TS6 specification. I believe there were also some TS6 vehicles bought new at about that time. One survives as a preserved vehicle but I am not sure where it is kept or whether it is in need of restoration. Interesting that most of the information cited in that wiki entry refers back to the KHF! I think it was taken in Palace Ave. Maidstone, opposite to the Mill St. Bus Station. The Len is behind the stone wall. As you say KK 3788 is a Tilling Stevens and was new in 1914. Kn 2395 is a Leyland, new in 1919. An early picture of a couple of M&D buses, taken if not before the first world war, then almost certainly very soon after. The front one is a Tilling Stevens, service No.1 Maidstone and Chatham. I can't determine the make of the other one but the service is No.3 Maidstone and Faversham. I can't identify the location - presumably it's somewhere in Maidstone? Wow - thank you, Peterchall in particular. The 90 rings a bell - we would not have started to go there before maybe 1961/2 as my grandfather retired in 1960 and they were living in Hayes near Bromley before retiring to Rotherfield. I seem to recall that we did not always have to change at Mark Cross, and also seem to recall that we had a choice of buses to Mark Cross, and I have a dim memory of conductors, but always just the driver on the little bus down to Rotherfield station. Maybe they curtailed the Tun Wells to Mark Cross section of the 90, maybe just at weekends (when we would most likely be travelling). I don't recall ever waiting at Mark Cross - there was a direct connection. I do remember now that the stops in Tun Wells were called the War Memorial, and think I was told that the grand building was the library. I think it was mostly the 191 we caught to Mark Cross. Thank you so much for filling in these details. One other thing I have forgotten from my Green Rover days in the late '60s was the M&D route (again an unusually small bus) from Sevenoaks to Borough Green garage using the back roads - beautiful trip, especially in spring with all the blossom - can't remember that route number either. The 'timetable point' is "Tunbridge Wells, War Memorial" and the bus stops are still there. Facing the War Memorial the left hand building is the Library and the right hand one is the Town Hall/Assembly Hall, but agreed that the entrance to the latter is round the corner off Crescent Road. The grand building in Tunbridge Wells where the bus stops were is The Assembly Halls. I think the grand building would have been the library and / or town hall, the bus stops would have been on Mount Pleasant and the LT stops at the bottom of Lime Hill Rd. I don't ever recall any bus stops by the assembly halls as all the buses would have come along Monson Road where a number of stops were located. The Saturday only Service 92, Wadhurst - Crowborough, was withdrawn in 1958, so it was not that you transferred to. If it helps to jog the memory, Services 79 and 90 were one-man operated from the mid-1950's, Services 152 and 191 went one-man from May 1966 - previously they had conductors. The best I can do is to give you information from the Summer 1957 timetable. In 1957 you could have gone from Tunbridge Wells to Rotherfield without changing, on Service 90 which was Tunbridge Wells – Mark Cross – Rotherfield – Crowborough. New here - I wonder if anyone can help me with details of a couple of M&D routes running out of Tunbridge Wells, no doubt, but straying across the border into Sussex. As a kid, in the mid 1960s, our family occasionally undertook a rather lengthy trek by bus from Biggin Hill to Rotherfield to see my grandparents. It would start with an invariably long wait for a 705 Green Line to Sevenoaks, where we would have another long wait usually for a 704 to Tunbridge Wells. The Green Lines from London were always held up in traffic. Once in Tunbridge Wells, I remember we would walk round the corner from the London Transport bus stop to an array of M&D stops in front of a rather grand building set back from the road with flower arrangements in front - a little higher than the road, I think. I cannot remember the route number of the bus we used to catch then, to Mark Cross, but I think it went to Haywards Heath, or maybe Eastbourne - it was jointly operated with Southdown, and was usually the lovely 36 foot BET single-decker - maybe Leyland Leopards with Willowbrook bodies? We then connected with an unusually short M&D (Reliance?) to Crowborough via Rotherfield and Jarvis Brook - I would like to know the route number. We would alight at the Rotherfield & Mark Cross station, closed (I have just found out) in 1965 - it was still open when we first started going there - once we returned by steam train to Oxted (and they let me in the cab - a nice memory!) Anyway - reading this part of the forum seems to reveal a number of folk who possess incredibly detailed information about buses - even back then. So, can anyone help? May 1st 1928 A sight for astonished eyes in Kent is the trolley bus, seen for the first time this week in Maidstone on the well used route to Barming. Northern cities have been using them for years but a regular service in London has still to be introduced. If the Maidstone experiment is a success a trolleybus will also run to Loose. "Kent a chronicle of the century" by Bob Ogley. 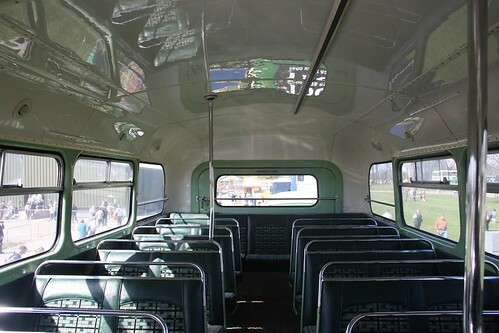 With the advent of the rear engined bus, such as the Leyland Atlantean, there was no need for a prop-shaft to run the length of the vehicle, so the floor could be low anyway. Nevertheless, I have a vague memory of M&D having some Atlanteans with the lo-deck configuration, thus giving a 'lo-lo-decker' - can anyone confirm? Quite right peterchall. They were outwardly the same as a "normal" height Atlantean, just not so high. Fourteen of the original order of fifty Atlanteans were of low height for operating under a low bridge in the Hastings area, I believe Cooden Railway Bridge. All initial fifty were allocated to Hastings as trolleybus replacements in 1959. Thereafter M&D only took Daimler Fleetlines when a low bridge type was required. Hope this confirms your memory! The Bristol Lodekka (and all other Bristol Commercial Vehicles products) were unavailable to Maidstone & District and other BET (British Electric Traction) companies between 1948 and 1969. 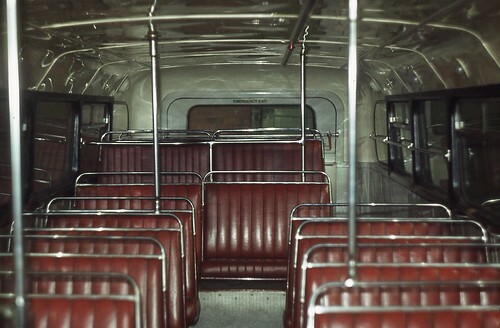 M&D's lowbridge Atlanteans were bodied by Weymann and seated 73 as opposed to 78 (later 77) for the Highbridge versions because they lost 5 seats upstairs. I spent the last few years periodically looking for interior photos of the original lowbridge Atlanteans after my one and only trip on Maidstone & District 6445 (45DKT) which was covering a Rochester Maths school service not long before its withdrawal in 1978. I finally found some on Flickr, namely Trent and Ribble examples which are thankfully now preserved as none of M&Ds were saved, especially DL43 which was one of the first 4 to be built and was exhibited at the 1958 motor show. Hopefully these photos show the main differences between Atlantean PDR1/1 highbridge and lowbridge variants (later PDR1/2s had a drop centre rear axle that removed the need for a sunken gangway altogether). The lowheight Daimler Fleetlines were ordered to allow the complete replacement of the front entrance lowbridge buses, along with high capacity single deckers. In 1973 when the lowbridge Atlanteans started to show their age, M&D received their first new Bristol buses for 25 years, they were Bristol VRTs with extra low ECW (Eastern Coach Works) bodies that were 13' 5" high but had 77 seats, the lowbridge Atlanteans' days were numbered and all 14 had been sold by 1978. Seven were sold to Western National in Cornwall and they (along with another 26 highbridge versions) allowed the rapid conversion of services to one man operation, soldiering on until final withdrawal and scrapping in 1982.